I have to admit I’ve never made a gluten-free pizza crust from scratch which is why I’m always on the hunt for a great tasting gluten-free pizza shell! 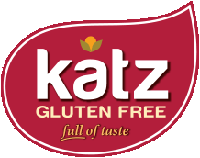 The other day I picked up a 12″ Three Cheese Gluten-Free Pizza Shell from Against the Grain Gourmet, located in the freezer section of my local Stop and Shop. I added the ingredients below and followed the label baking instructions and it came out perfect … doughy with just the right amount of crispness! I love the combination of arugula and goat cheese on a salad, so I thought I’d try them on a pizza! I’m trying to cut down on tomatoes (due to acidity), so added just a few dollops of sauce. I was desiring a sweeter tasting pizza, which is why I added the caramelized onions and raisins. Slivered carrots add a bit of color (& beta carotene!). Include or omit any of the ingredients to suit your particular palate (but I don’t recommend omitting the olive oil, arugula, goat cheese, onions & rosemary!). Brush the pizza shell with olive oil, then top with arugula, caramelized onions, salt, pepper, fresh (or dried) rosemary, slivered carrots, raisins, and then sprinkle on goat cheese. Bake frozen shell directly on oven grill for 10 to 15 minutes at 375 or until cheese is bubbly. Keep an eye on pizza to avoid overcooking … otherwise crust become too hard and the ingredients won’t taste as fresh! 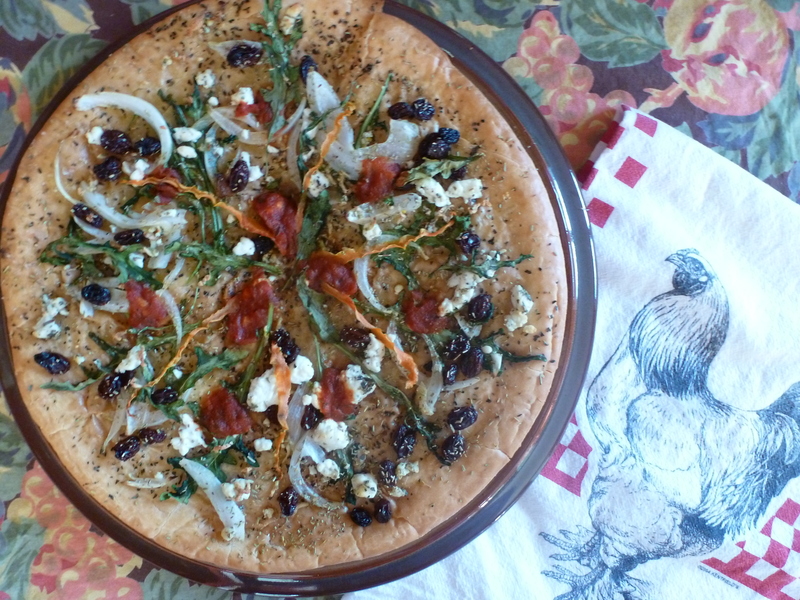 Check out Against The Grain pizza crusts (products made in a gluten-free facility in Vermont) … I was not provided a sample, and purchased the shell myself. 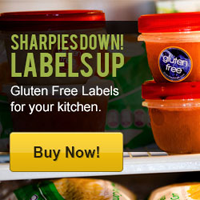 Do you have a favorite brand of gluten-free pizza shell? What do you like to add for toppings?